The DIY project is every handyman’s favourite pastime. The task is simple - find something that you can build with hammers, nails, shovels, drills and other things that make loud noises. The build is often completed across several weekends, mostly with your mates, and usually accompanied by several beers and a BBQ. We’ve provided you with some inspiration for your next DIY project below. There are a lot of great stores that provide great ideas and everything you need to get your next DIY project on the go, such as Fabric Solutions Australia. Instinctively, every man wants to build something for himself – a tool shed, a nice big deck or just a nice slab of concrete. Occasionally it’s nice to take the time to build something for the little people. Nothing entertains a child quite like a sandpit and it’s the perfect project for entertaining those DIY desires on a Sunday afternoon. Grab your shovel, hammer and nails and start exploring what works best for your yard. Take care in selecting the location. Ensure you’re in close proximity to both the hose and the water supply. Consider where you can base your sandpit to reduce the likelihood of any pets choosing it as their new litter box. Pick a simple design, in a location shaded and visible. If necessary, look at erecting a small shade cloth over the area. It’s the perfect project to keep you occupied and make sure you’re in the good books with the kids. Adults need somewhere to relax and get away sometimes too. What better set up than your very own Bali hut? 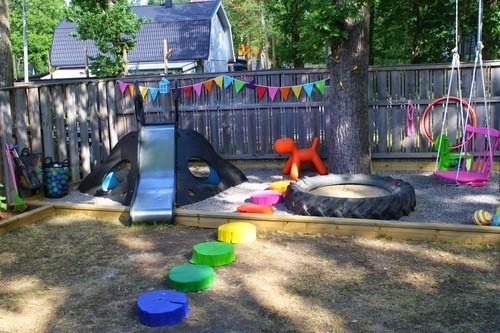 This DIY project is quite commonplace in the average backyard and can actually be done on your own, with some mates for assistance, of course. Starting from scratch could take you some time, however there are plenty of DIY kits available to purchase from reputable suppliers. These kits can be delivered to your door meaning all that’s left for you to do is assemble. Once complete, peace and serenity is yours at last as you put your feet up in your own little slice of paradise. If you’re lucky, you may even find yourself a great deal on a home spa to top it all off. Every great back yard has got that something special – something that sets it apart and makes it memorable. Creating an entrance to your own secret garden should do the trick and it’s all about the magic of illusions. Find a nice solid part of your fence or brick wall that is close to your plants and trees. Take an old full length mirror and secure it to the wall or fence. Finally, take an old garden gate, preferably one of equal height to the mirror, and affix it securely, slightly ajar, to the mirror. If placed appropriately, the reflection of your garden against the mirror will give off the magical illusion of a doorway to another world that will make any person with an imagination smile. With enough time and creativity, any DIY project can turn your backyard into a little slice of paradise for yourself and your loved ones. Ultimately, find the project that speaks to your skills and you will build something that makes yourself and your family really happy with the backyard.